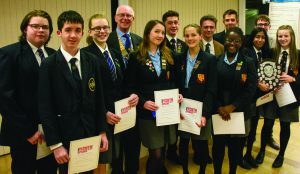 STUDENTS from Woking High School enjoyed a double delight when they won both categories of the district round of a Youth Speaks competition. The school’s Team A won the Rotary Club of Woking District senior section, and the school’s Team B was successful in the intermediate section. Team A spoke on the subject Winning at all Costs? And team B spoke on the topic Is it the End of the Road for the Car? Woking High A was represented by Sam Webb, Rithika Muralidharan and Alys Harrison. Woking High B was represented by Abigail Lambert, Charlotte Hamilton and Tony Webb (RHS). The public speaking competition for schools was held at the Dianthus Centre in Goldsworth Park recently. Event organiser, Rotarian Peter Kleyn said: “I am pleased to say that this competition remains very popular and every year the bar gets higher. “The ability to speak well in public is a key development skill for young people, and it is no wonder that we saw every team performing to a very high standard. “Congratulations on the use of vocabulary and public speaking techniques that were mastered by all teams. Seven teams contested the event and included teams from St John the Baptist and Gordon’s School. The competition was open to teams of three, and each consisted of a chair, speaker and vote of thanks. Judges awarded points to the teams for fulfilling certain criteria; such as demonstrating clear thinking and their ability to summarise complex subjects.